HANNAH Stagg has been counting down the number of sleeps until she gets to start school. The Proserpine youngster will be among students who start Prep at St Catherine's Catholic College on Tuesday. 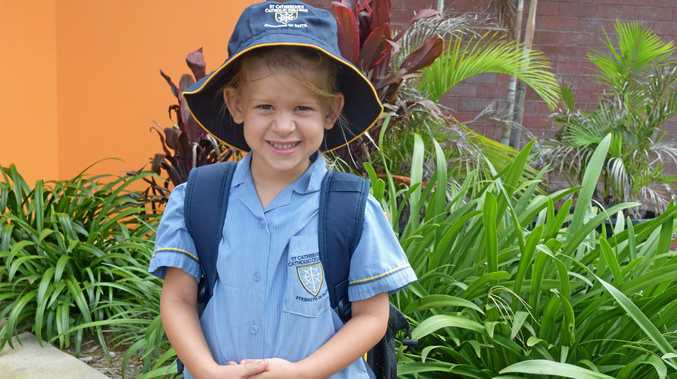 Although the four-year-old was coy when it came to telling the Whitsunday Times about her hopes for school, mum Melissa Stagg said she was looking forward to going. For Hannah, the countdown started when she went to the step up day at the school in October, but had ramped up in the past two weeks. "She's been looking at how many sleeps until she starts,” Mrs Stagg said. Mrs Stagg said she didn't expect any tears from Hannah on Tuesday, but admitted it would be quiet at home without her. "She's ready. She's excited,” she said. As a child who lives on a property, Mrs Stagg said Hannah may have some problems spending her days in the classroom. "Hannah's used to being outside and being outdoorsy,” Mrs Stagg said. Hannah's family has a long history with St Catherine's Catholic College. While she will join older sister Sienna, 6, at the school, her cousins will also be familiar faces on the playground. Her mum, uncle and aunt also teach at the school. Hannah will also be third generation at the school with her mum, uncles and her grandfathers also going to school there.